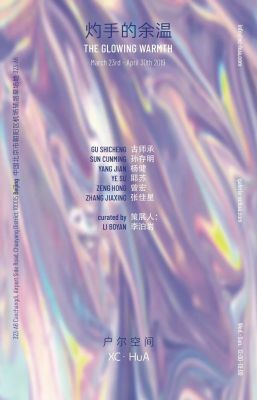 XC.HuA is delighted to present, The Glowing Warmth, a group exhibition featuring Gu Shicheng, Sun Cunming, Yang Jian, Ye Su, Zeng Hong and Zhang Jiaxing， curated by Li Boyan. The opening will take place on Saturday, 23.03.2019. The exhibition explores the feedback given by the outside world when the artwork, in appearance, transcends into the realm of triviality and also investigates the evolution of art in the near future as a whole. Zhang Jiaxing, an artist living in Yanjiao, seeks value from the waste of building materials and household garbage that can be seen everywhere in daily life. The “waste” which has been piling up in the studio over a large period of time emits the sadness, helplessness and humor of the surrounding area. After reorganizing and reshaping the waste, the innate commercial value of the goods begins to mutate - neon lights, graffiti and partially covered words takes on a new identity of the forgotten corners. This proletarian creation model reveals the sorrowful poetry of wanderers. For Gu Shicheng, urban life upholds the notion that the worship of capital and money never is compromised. Under the golden appearance of his works, luxury items, industrial production, and popular culture reveal the realizations of his own life. He crafts words and shapes into statements which are created with the equivalent precious metals: a handshake of money and rights. Zeng Hong bears witness to the adjustment of the economic model and industrial structure in the 1990s. He used the construction of state-owned enterprises in the last century as a motif, constantly finding a balance between imprisonment and activities, painting and machinery. These seemingly uncomplicated images reflect on the consensus and the scars of historical trajectories. Sun Cunming's creed is concerned with the difficulty in distinguishing between the source and the result. He believes discrimination and thought were powerless and borrows the ready-made products in life, which he redefines, changing the object's original semantics, extending its appearance romantically or ambiguously by means of subtle movements. In thinking about the ultimate aspiration of mankind (or ultimate pessimism), Yang Jian buried his original sculpture (the astronomical telescope) under the land of the wilderness outside Beijing, trying to reverse the long-term ideals of mankind with by his actions. This SDSS is a fiber optic plug-in of the Spectral Telescope. The same batch of other astrolabes was transported to the Chinese Academy of Sciences for scientific activities. They represent certain celestial areas, and the proposition of “not bothering to look up” is the artist’s gift to the lucky ones. Ye Su chose another way for future generations to remember today, that is, the statue, which is one of the most traditional ways for mankind to shape civilization. He portrayed well-known fast food as an eternal statue, seeking a connection between speed and eternity. Under the attitude of “energy storage”, junk food is a symbol of history, a sign that will be constantly spoken and remembered by future generations. The exhibition The Glowing Warmth attempts to reposition the relationship between art and social existence by transforming the critical posture into the continuous residual warmth. Art becomes a tool for an urgent response to reality, whether to preserve or to prolong the perceptual dimension of numerous real-life situations or connotations, thus continuously giving viewers burning enlightenment in the realistic residual warmth. As Hegel said: "History is a pile of ashes, but there is a temperature in the depths of the ashes."